Lyrics: "From my wounds, my weapon has emerged. Yasser Arafat: "For our movement, ‘armed struggle’ means taking part in an armed revolutionary war of the masses." “’If the Elder (i.e., Yasser Arafat) had been alive, the Arab and international media would be loud and raging from the pictures of violation and crime carried out against the boy Ahmad Manasrah (i.e., young Palestinian terrorist who stabbed two and was shot by Israeli security), as he [Arafat] was not just a president, but a media person who knew how to harness the media to the cause’ – this is the essence of the matters about which the media people and officials who worked with the late President Yasser Arafat unanimously agreed. 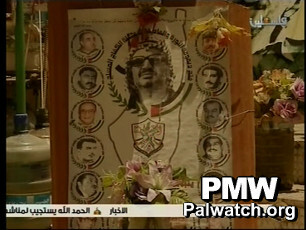 The image shows Yasser Arafat. First image shows a map of Israel in a cemetery with pictures of “the Martyrs” (Shahids) of Fatah, among them terrorists Abu Jihad and Abu Iyad. 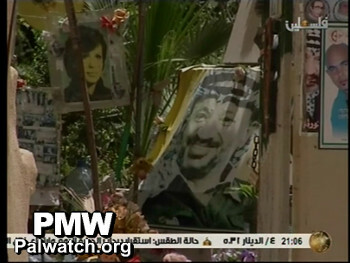 Second image shows a cemetery with pictures of Yasser Arafat and terrorist Dalal Mughrabi. 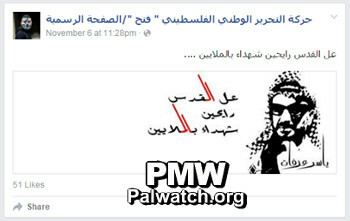 Notes: Abu Jihad (Khalil Al-Wazir) was a founder of Fatah and deputy to Yasser Arafat. He headed the PLO terror organization's military wing and also planned many deadly Fatah terror attacks. These attacks, which killed a total of 125 Israelis, included the most lethal in Israeli history - the hijacking of a bus and killing of 37 civilians, 12 of them children. Official Palestinian TV program A Nation is Built. Note: The Al-Aqsa Martyrs’ Brigades - established by Arafat in 2000, when he started the PA terror campaign (the second Intifada). He unified separate Palestinian armed groups into a single body under the name The Al-Aqsa Martyrs' Brigades, which is still Fatah’s official military wing today, and is on the US and EU list of terror organizations. Official PA TV News report on the weekly demonstration near the central headquarters of the Red Crescent in Gaza, at which families of the prisoners honored Yasser Arafat on the anniversary of his death. An Al-Aqsa Martyrs’ Brigades movie named "The Revolutionists of the Land"
The Al-Aqsa Martyrs’ Brigades were established in 2000 in the West Bank and the Gaza Strip, by order of the late Martyr (Shahid) Yasser Arafat, as Fatah’s military wing. The triumphant brigades began their military operations (i.e., terror attacks) during the second Intifada, the Al-Aqsa Intifada (i.e., PA terror campaign 2000-2005)...The Al-Aqsa Martyrs’ Brigades, with their mighty Nidal Al-Amoudi division, still embody the spirit of Fatah’s armed resistance, through their active and high-quality participation in the wars being initiated [ by Israel], one after the other, against the Gaza Strip. They are proving themselves a pure and stubborn rifle in the face of the Zionist enemy." For a longer transcript and descriptions of the terrorists, click "full article." Interview with Fatah Central Committee Member Azzam Al-Ahmad on Jordan TV’s Third Opinion program. they didn’t [succeed], and the [armed] operations continued – albeit on a lower scale… We moved away from the border. The first Intifada (i.e. the first Palestinian wave of violence against Israel, 1988-1993) was born in ’87 and did wonders, and in its wake, in ’88, came the declaration of independence. (i.e., when Arafat declared Palestinian independence in Algeria). Part of the fourth episode of the 2011 Palestinian-produced documentary “Arafat” was broadcast on PA TV again in January 2013 as an introduction to a PA ceremony. The film states that at Camp David, Arafat was subjected to fourteen days of heavy American-Israeli pressure to abandon Palestinian claims for the Right of Return and for Jerusalem. Narrator: “The Camp David summit failed, and [Bill] Clinton held Arafat responsible for the failure. This was the preface to very serious events. [Then Israeli Prime Minister] Ariel Sharon violated the Noble Sanctuary (i.e., The Temple Mount), and the second Intifada (i.e., PA terror campaign 2000-2005) – known as the Al-Aqsa Intifada – began on Sept. 28, 2000 as a direct reaction to this [Sharon’s] violation. This was, however, also a reaction to years of determined Israeli efforts to subject the Palestinians and their national authority. Part 4: "The Besieged President"
Narrator: "The Camp David Summit [in 2000] failed, and [US President Bill] Clinton held Arafat responsible for the failure. This was a prelude to very grave events: [Israeli Parliament Member] Ariel Sharon invaded the Noble Sanctuary of Jerusalem (i.e., the Temple Mount), and the second Intifada, known as the Al-Aqsa Intifada, broke out on Sept. 28, 2000 as a direct response to this invasion. However, it was also an outburst against Israel's insistence over the years on suppressing the Palestinians and (speech unclear) their National Authority." Former head of Arafat’s office: Fatah slogan was and still is "All rifles towards the enemy"
PA TV program Topic of the Day. Topic: the anniversary of Arafat's death. Guests: Former assistant for security matters to the Supreme Commander (Arafat), Ismail Jabr [currently advisor to Abbas on district affairs] and former head of Arafat's office, Sami Musallam. PA TV host [addressing Jabr]: "You were at [military] bases and you trained many people, Palestinians and Lebanese. People also say that the Shahid (Martyr) Yasser Arafat instructed that brothers from the Hezbollah and the like should train at Fatah bases – I mean, the bases of the revolution. Is that correct?" Jabr: "We don't deny that. We do not deny that. There were people from the Hezbollah leadership, who had originally been in Fatah, and they acknowledge this. We are proud of that." Host: "That is our pride." Jabr: "The Amal movement (i.e., Shiite national movement in Lebanon, which began as a militia) was among those [that trained]. We are proud of that. We trained them and armed them and withheld no effort from the Lebanese National and Islamic Movement." Musallam: "Our slogan was always, and still is – [corrects himself] – at that time – ‘All rifles towards the enemy.’ Any rifle which, together with us, was against the enemy – the Fatah movement and the PLO leadership supported it. We are in favor of the national liberation of all the nations which are under colonialism and are under oppression, and we used to help, just as others helped; we used to help others to achieve, or to take part as far as possible so that they would achieve their aims. 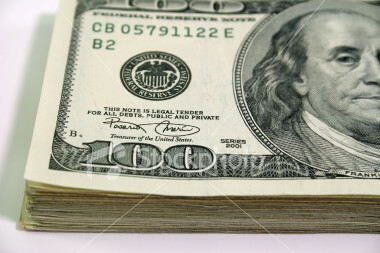 We helped in Africa, we helped in Latin America, we helped in Asia, in all countries, all nations. The help wasn't necessarily military. The help could [also] be adopting fighters." Headline: "Factions and prominent social figures call to maintain the principles and the rights for which Yasser Arafat fought and died as a Shahid (Martyr)"
"In the same regard, [released prisoner and expert on prisoners' affairs, Abd Al-Nasser] Farawneh stated that the Martyr Arafat believed in the importance of the determined and intensive effort to liberate the prisoners by all means. From the outbreak of the modern Palestinian revolution he developed the doctrine of capturing and kidnapping occupation soldiers, civilians and settlers within Fatah and by the PLO factions." "We believe in only one means, and that is armed resistance, in which we have complete faith, to liberate our country." "Abbas Zaki, member of the Fatah Central Committee, recalls the Shahid (Martyr) Yasser Arafat on the anniversary of his death, as he was during the years of the siege. He says, 'Yasser Arafat had the idea that 'the shortest route to Jerusalem is the armed struggle'… Along with other slogans, such as: 'A million Shahids are marching to Jerusalem'. He knew that he was planting in the Palestinians of that generation [the idea] that Jerusalem needs millions of Shahids, for it is the mother of battles and of Ribat (religious conflict/war defending Islamic land) until the Day of Judgment."